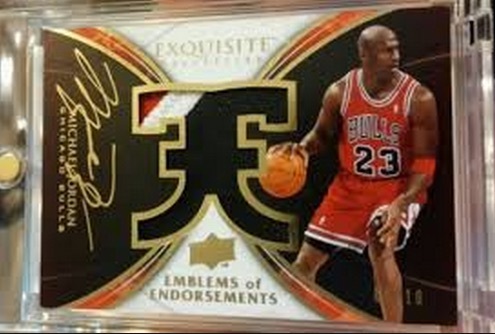 By now, anyone that has collected sports cards or memorabilia is aware that Michael Jordan is an unstoppable force in the hobby and not just limited to basketball collectors. However, that does not make the prices that his premium items sell for any less staggering. With that in mind, check out some of the impressive items that topped the charts in 2014-15. The following list includes the top 15 sales for Michael Jordan collectibles during the period from February of 2014 to February of 2015. The list was compiled from completed sales on eBay over that time. Using the "Most Watched List" tab above, view a real-time look at the top Michael Jordan collectibles currently on eBay. The first of several Michael Jordan rookie cards on the list, we kick things off with a PSA 10 version of one of the most celebrated cards in the history of the hobby. 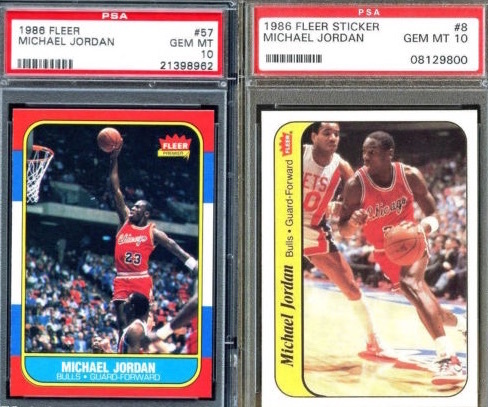 While a Gem Mint card for Michael Jordan would appear to be very rare, 204 cards have received the same grade from PSA. Arguably one of the greatest seasons for Michael Jordan, the 1995-96 season saw the Bulls win an NBA-record 72 wins and claim their fourth title in six seasons. It was also the beginning of the team's second three-peat. These game-used shoes are from that memorable season and were each signed by Michael Jordan. While Exquisite Collection is in a class of its own for basketball collectors, the Limited Logos inserts are in an even rarer group in the hobby. An on-card autograph and patch piece for MJ is made even more appealing based on the BGS 9.5 grade. The autograph is also graded a perfect ten. On January 1, 1997, Michael Jordan dropped 51 points on the New York Knicks in Chicago. This barrage of points from Michael Jordan was apparently a response to comments from the Knicks head coach, Stan Van Gundy. Van Gundy reportedly said Jordan was a "con man" based on his tendency to befriend opposing players before trying to destroy them on the court. 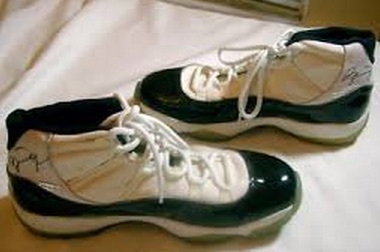 Michael Jordan wore these sneakers during that game. He later signed the right shoe and they were gifted to a New York Knicks player. 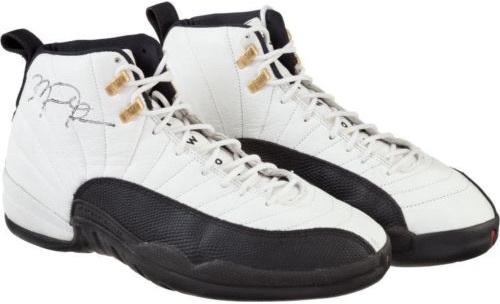 The listing for the signed shoes was actually part of a live Heritage Auctions event, and the final price, including buyer's fees, was $20,315. Also part of the same Heritage event that included "The Con Game" sneakers, this game-used 1986-87 jersey documents the breakout season for Michael Jordan. After missing much of the 1985-86 season, Jordan averaged 37.1 points per game during 86-87, the highest of his career, and he became the first player in NBA history to record 200 steals and 100 blocks in a single season. Including the buyer's fees, the final price for this jersey stands at $22,705. The second Jordan rookie on the list, this BGS 9.5 has a perfect grading (10) on both edges and surface and is only 0.5 away from a BGS 10 grading. 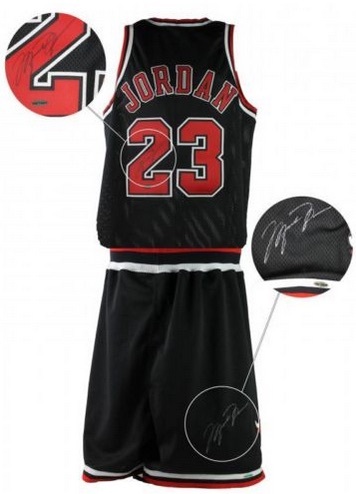 Game-worn by Michael Jordan during the 1997-98 season, the striking black alternate uniform is signed on both the jersey and shorts. This season is memorable as it was the final year Jordan played for the Bulls before his retirement and he went out on top, with his sixth title, sixth Finals MVP, fifth regular season MVP and third All-Star MVP. The only other Exquisite Collection card on the list, the gold ink and large patch makes this Emblems of Endorsement card a hot commodity, as evidenced by the final price. There are only ten of these cards in existence. 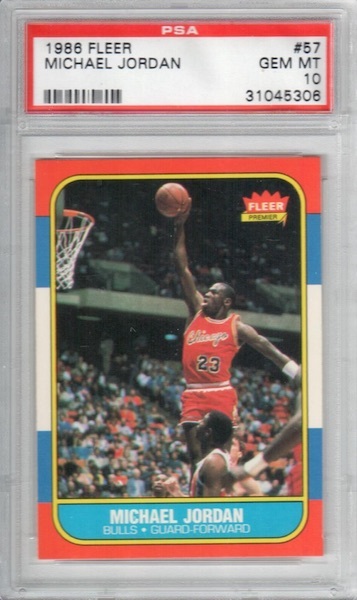 Star Company may play second fiddle to Fleer in terms of the rookie card designation for Michael Jordan, but it is certainly nothing to overlook and many consider it his true rookie. 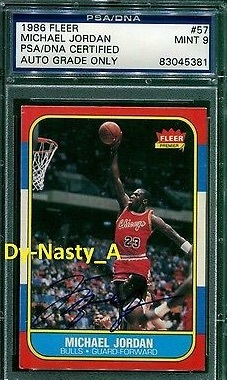 This particular card is a BGS 8.5 and also features an autograph for Michael Jordan that is graded a perfect 10. 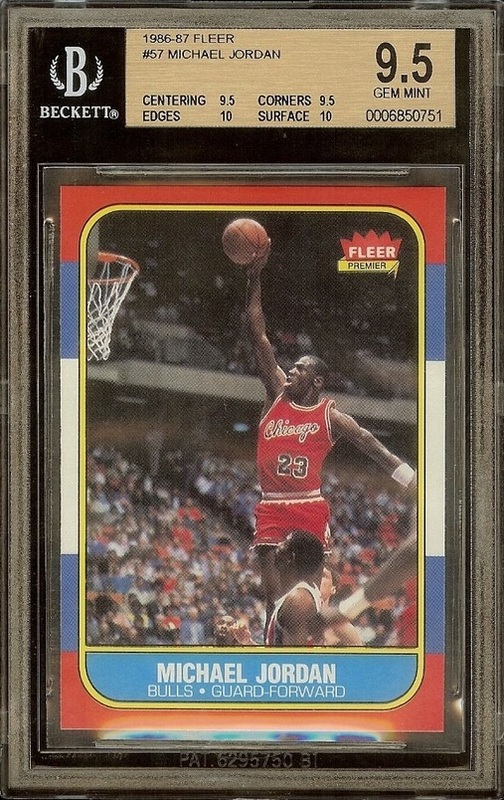 In addition to the base rookie for Michael Jordan, 1986-87 Fleer also contained a sticker insert. This lot included PSA 10 versions for both cards, which explains the increased value. 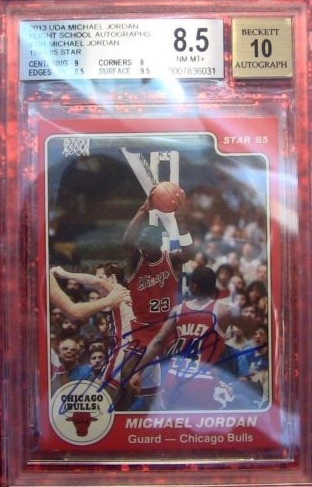 An increasingly uncommon sight, this card combines two "holy grails" for Michael Jordan collectors with an on-card signature and a Michael Jordan rookie card. Item number nine on the list consisted of a signed and game-worn Michael Jordan uniform from his final regular season with the Chicago Bulls. The only way to better that is with a game-worn jersey from his last NBA Finals. That is exactly what a deep-pocketed buyer obtained when they purchased this signed jersey from the 1997-98 Finals. 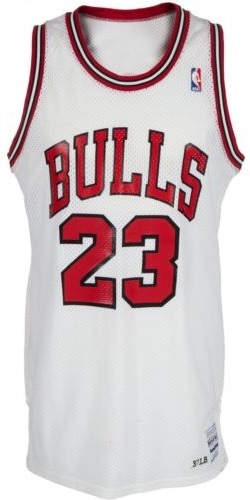 The jersey is believed to have been worn by Jordan during all three of the games played at the United Center for the NBA Finals. 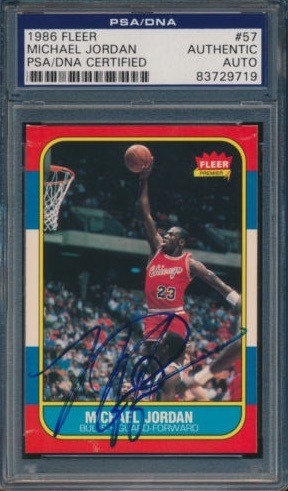 Whereas the autograph on the 1986-87 Fleer rookie for Michael Jordan at number five was a little sloppy, this example received an autograph grade of Mint 9 from PSA. 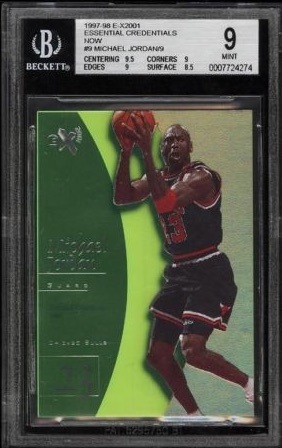 Rare parallels from the 1990s are still very popular with collectors, so it should be no surprise to see one crack the top sales list for Michael Jordan. This limited Essential Credentials Now parallel from 1997-98 E-X2001 is one of only nine copies and received a BGS 9 grade. One of the most iconic Michael Jordan cards of all-time, this rare card features an on-card autograph and large jersey piece. 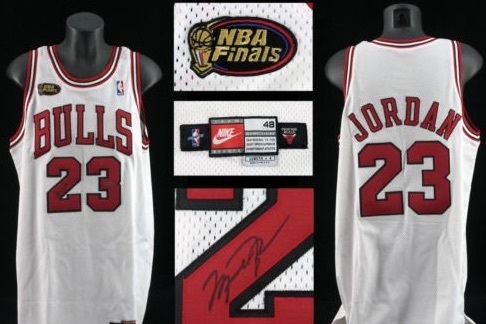 The piece actually comes from Jordan's 1992 All-Star game jersey and the card is hand-numbered to only 23. While these cards do command strong value normally, the premium price comes courtesy of the overall BGS 8.5 grade, which makes it the highest grade on record. Subgrades include an 8.5 for centering, corners and edges, and the surface was graded a 9. The on-card autograph received a perfect 10. 1994 UPPER DECK SALUTES MICHAEL JORDAN CARD "LIMITED EDITION" COA "LOW NUMBERED"
2007-08 MICHAEL JORDAN CHICAGO BULLS RCF GAME-USED TRADING CARD MINT+++COND. 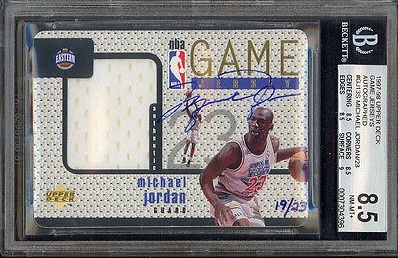 The following real-time list features the most-watched Michael Jordan cards and memorabilia on eBay. Whether you are looking for something specific or simply like to window shop, check back often to see the most popular current collectible options for MJ. Michael Jordan UDA Upper Deck 1984 Signed Autograph Rookie Away Jersey 1 23 1 1!